Today’s defence related news includes coverage of the MOD gifting unused ration packs to charity. The Daily Express, the Daily Mail, The Daily Telegraph, The Sun, the Daily Record and the Daily Mirror all report that the MOD will be gifting thousands of unused ration packs to charity over the next few years. Under the new plans, the military will provide operational ration packs to FareShare, a charity who distributes food to nearly 10,000 UK charities, including community groups and lunch groups for the elderly. The ration packs are enough to sustain ten soldiers for a 24 hour period and include items for breakfast, lunch and dinner, such as porridge, sausages, baked beans, pasta and rice. Ration packs help provide nutritionally balanced meals to our armed forces on operations around the world. But charity begins at home, and I’m pleased our partnership with FareShare will make sure no food goes to waste. FareShare does a fantastic job redistributing food across the country and I’m proud the military can support communities in this way. 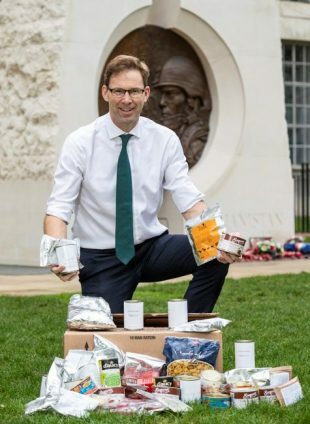 Defence Minister Tobias Ellwood MP, seen here holding the 10 Man Ration box, outside MOD Main Building in London.